California’s floriculture crop leads the nation with a value of $1.13 billion in sales, according to a new report from the USDA’s National Agricultural Statistics Service (NASS). In 2013, California producers increased their sales from $1.10 billion to $1.13 billion, an increase of 3 percent, giving California 26.6 percent of the total U.S. wholesale value. California cut flower production accounts for 78.2 percent of the total cut flower wholesale value. The $327 million value was down 2.7 percent from the 2012 value of $337 million. California leads the nation in potted flowering plant values for 2013 with a total value of $297 million, a 17 percent increase in value from $253 million in 2012. California potted flowering production accounted for 38 percent of the 15-state wholesale value. 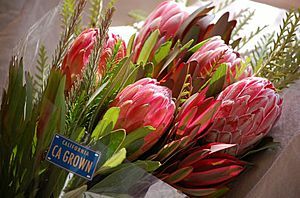 The top cut flowers in California are lilies, daisies, roses, chrysanthemums and snapdragons. The top potted flowers are orchids, roses, poinsettias, spring bulbs and chrysanthemums. The top garden plants are vegetable varieties, pansies/violas, petunias, impatiens and marigolds.